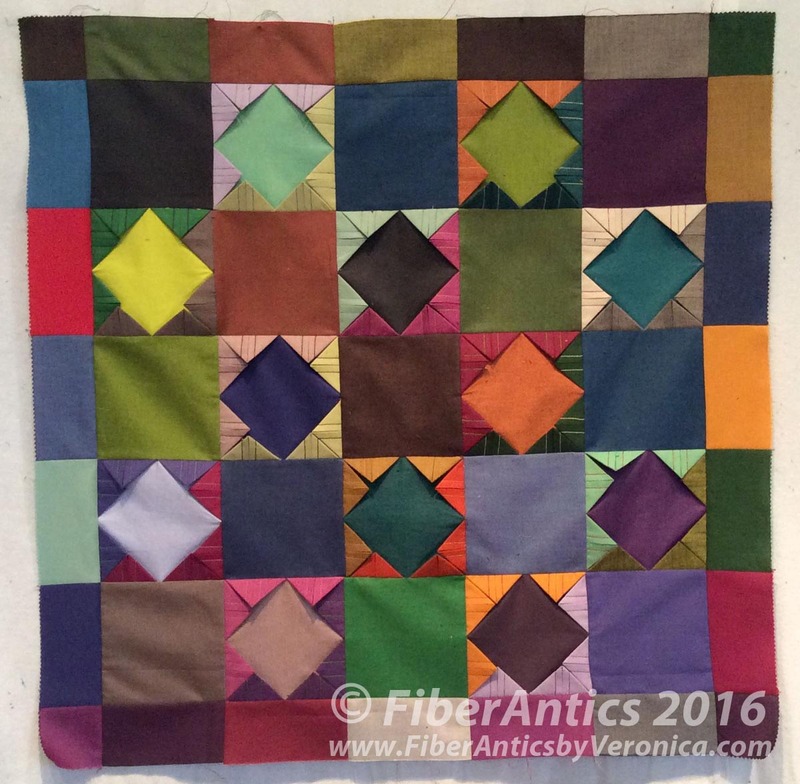 This is Part Two of my rendition of the Point Taken quilt. See Part One for the fabric selection and quilt top assembly. With the quilt top complete, it was on to the decisions about quilting. This step began by cracking open the sketchbook and doing sketches. I opted to quilt down the prairie points making the blocks look more like a "square-in-a-square" block pattern. 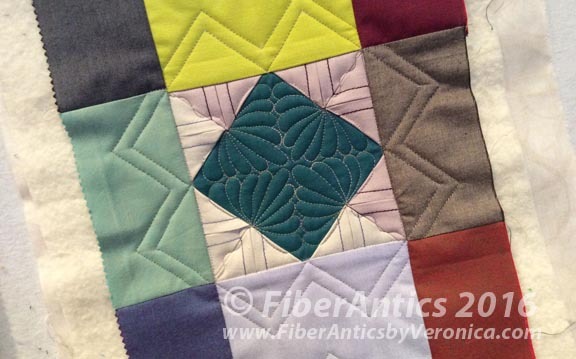 I needed a quilting design that would skim the edges of the points and also take advantage of the center space. Ideas for quilting from the sketchbook. Long-arm quilters generally don't embrace quilting quilts with dimensional items (prairie points, flat piping, etc. ), but on my domestic sewing machine, I just opt for a closed toe free-motion foot and go for it. My Janome 6500 also has the capability of adjusting the height of the presser foot. I increased the clearance between the foot and the bed to accommodate quilting over the multiple fabric layers of the prairie points. 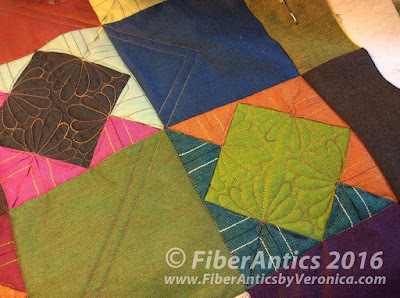 With a few remaining charm squares, I made and sandwiched a block to check/balance thread tension, practice the free-motion quilting designs and free-motion ruler work, and to insure my FMQ foot cleared the thickness of the prairie points and at the block intersections where many fabric layers converged. 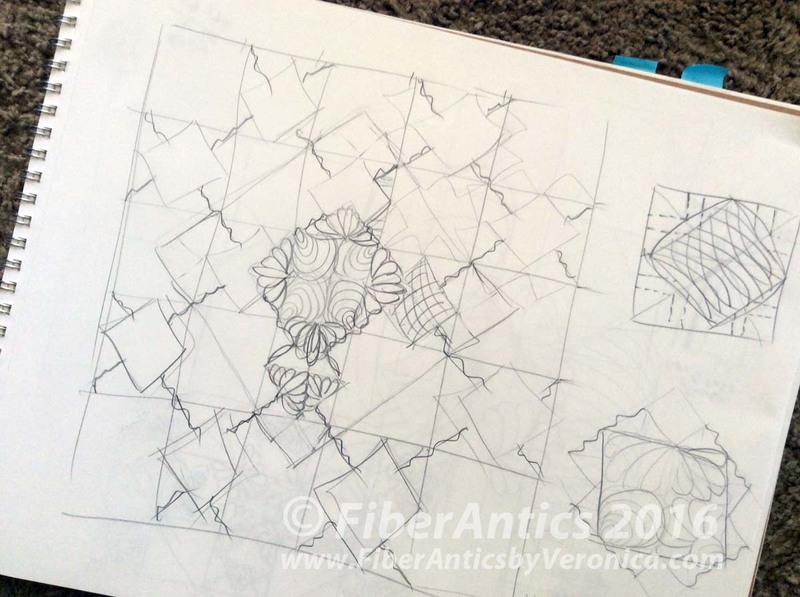 Practice block for FMQ designs and rulerwork. The FMQ on the prairie points was done first. Another WonderFil cotton thread, Tutti color #34 called Box Turtle, a 50 wt. variegated, was used for the free-motion. The colors of Box Turtle are lovely together—sunflower gold, a dark dusty raspberry, and a gunmetal gray that sometimes looks like a deep forest green. And they melded perfectly with the shot cottons. 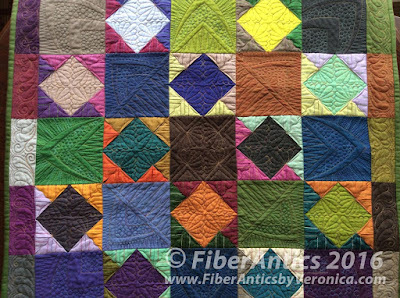 It was interesting to watch the colors from this variegated spool change and complement the fabric colors as each motif was quilted. 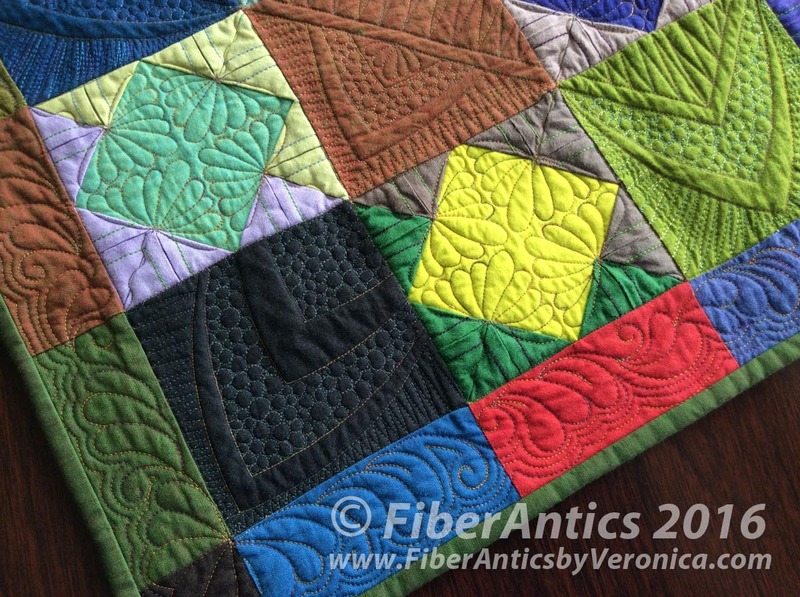 In this quilt, the variegated thread definitely enhanced the quilting. 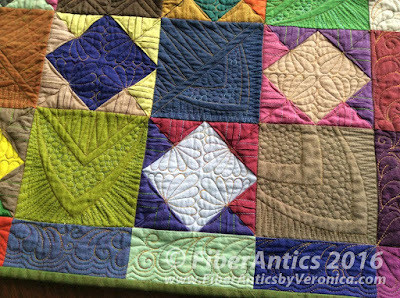 the quilting on the shot cottons. 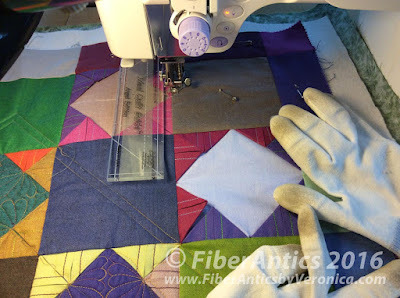 In preparation for the free-motion ruler quilting, I changed over from the regular free-motion foot to the ruler foot. 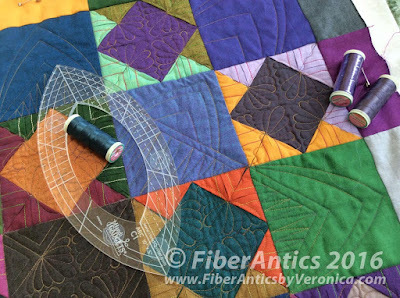 Since creating my "Defining Contours" class, which includes an introduction to ruler work using a domestic machine, I look for quilts to practice and improve my skills using rulers and acrylic quilting templates (the curved ones are trickier!). Free-motion quilting with a ruler and the ruler foot. Please ignore the worn out quilting gloves. I use them a lot! Curved ruler work using acrylic templates. My goal was to superimpose a larger quilted motif over the quilt rather than do block by block quilting. I think this was achieved. The on-point central quilting motif brings a cohesiveness to the composition. The arc motifs on the center medallion were echoed in the corners. Free-motion fillers and ruler work. A change in size of several motifs added variety. The quilted arches in the center motif are echoed in the corners. Free-form feathers in the border contrasted with the geometric shapes made with the ruler work. Free-form feathers run around the border. Before trimming and adding the binding, the quilted sandwich was blocked, which I will document in Part Three. Thanks, Sharon. It was a good FMQ skill-builder piece. 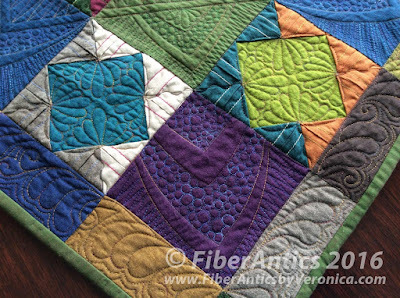 Intro to Free-motion Quilting—Let's Do It!